Resilience is the ability to adjust to circumstances and keep going in the face of adversity, whether it’s a minor hassle or a major life event. Resilience also helps us take on challenges, form stronger relationships, and embrace new experiences. A lack of resilience can lead to anxiety, poor self-care, depression, and risky behaviors, such as substance abuse. A variety of factors are associated with resilience, including healthy relationships, good self-care, and an optimistic outlook. Resilient people use this skill set to respond to problems more effectively and balance life's demands. They're confident in their ability to handle any situation, better able to cope with stress, and more likely to achieve their goals. Do resilient people experience less adversity? No. Resilient people experience difficult situations and unpleasant emotions, but they're able to cope more effectively and bounce back faster. We can't always control events, but we can control our response to them. Yes. Resilience is an essential skill for everyone to learn and develop. We can all become more resilient, regardless of our upbringing or current circumstances. 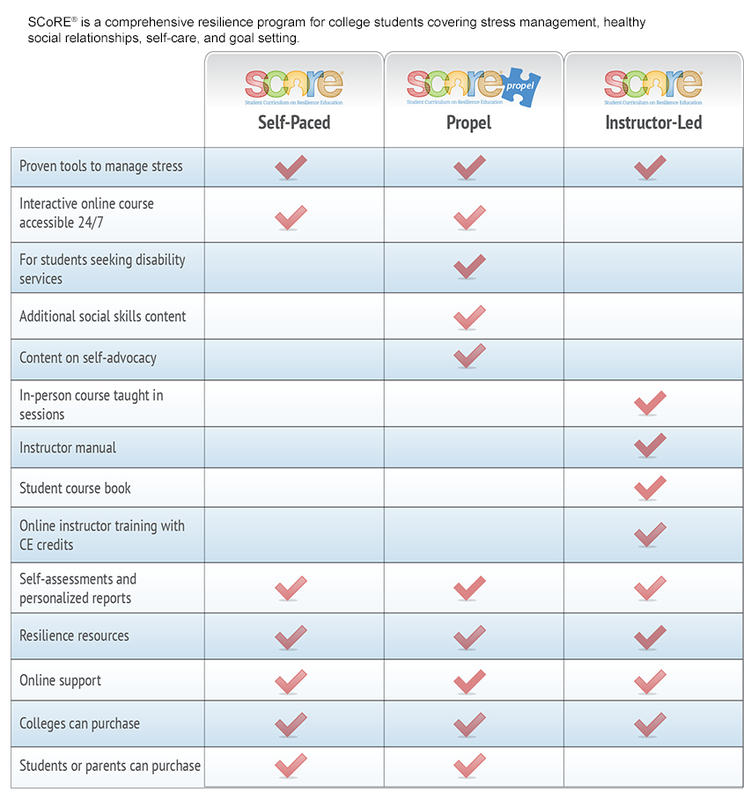 For information about college students and resilience, read about the SCoRE® program on our Program Overview page. Identify your sources of stress and how they affect you. Once you understand how your behavior changes in response to stress (e.g., your health suffers, you isolate yourself from others), you can modify unhealthy or unproductive reactions and develop coping strategies for your vulnerable areas. Negative or inaccurate thoughts about ourselves, others, or the future can produce unhelpful emotions and behaviors. Increase your awareness of how you interpret events so you can challenge and alter counterproductive thoughts and develop a more adaptive thinking style. Positive social connections provide assistance, guidance, and comfort during difficult times. Strengthen your relationships with family, friends, and trusted others to form a support network. The quality of these relationships is more important than the quantity. Pay attention to how you take care of your physical, mental, and emotional health, including your attitude toward yourself. Whether it's avoiding health hazards, managing your time better, or simply being kind to yourself, find ways to enhance your self-care in each area of health. No one area is more important than another; strive for balance. Setting goals provides us with purpose and direction. Pursue goals that are meaningful to you. When your goals, and therefore your behaviors, align with your strengths and values, you're more likely to succeed. Article from the American Psychological Association that explains how to develop and enhance resilience despite challenging life experiences. Articles about resilience, weathering tough times, cultivating optimism, and related topics, as well as links to resilience-related blogs. Article from the Mayo Clinic that provides tips on building your resilience. The Substance Abuse and Mental Health Services Administration's collection of brief articles and tips about personal resilience, as well as resilience in the realms of family, organizations, and communities. About.com addresses resilience through articles, tips, and a resilience quiz. Resource for developing resilience in yourself, your work teams, and your organization, hosted by Al Siebert, PhD. Contains articles, stories, and other resources and links.